This sentence from p. 316 reveals Ludwig’s affinity with the Law of Fives and thus his identity as a Discordian Saint: “It is extraordinary what potential Beethoven could still find in the conventional progression of the circle of 5ths.” Again, we see this on p. 318: “During the first doublet, the accompanying instruments rock in hemiola, or cross-rhythms of 3 x 2 beats cutting across 2 x 3;”. It recalls the Golden Dawn formula, 5 = 6. Looking up “hemiola,” in pitch it refers to the interval of a perfect fifth. Kerman didn’t talk about pitch in this example though perhaps he sneaked in a pun? Two recent coincidences. Continuum publishing house has a series of short books called 33 1/3 where different authors examine classic albums. I randomly opened one on Brian Eno’s “Another Green World” to an interview transcript of Eno talking about the creative process. He begins by saying that Beethoven didn’t have all his string quartets in his head and goes on from there. I ended up reading the whole book and found it quite good. Fans of Eno will enjoy and discover more about his artistic process which incorporates chance operations among other things. I tried to get my control obsessed client to read it without success. The second one involved randomly opening the 33 1/3 on the fourth Led Zeppelin album, the one with four symbols for a title. It opened to this sentence on p. 68: “After Beethoven’s symphonic revolution, many nineteenth century composers explored ‘programme music,’ self-consciously linking narrative imagery and events to instrumental themes and developments.” I started, but haven’t finished reading this one. It’s by Erik Davis, one of my favorite writers, and seems the best yet on the mighty Zep, focusing on the music and influences rather than their extracurricular activities; definitely the best one to explore the Crowley connection though linking Page to diabolism seems disingenuous or writing from a different point of view. He even brings in a passage from “The Vision and the Voice,” that could just as well apply to Beethoven. Very interesting. I plan to listen to a lot of Zep in January. I googled hemiola and got the definition: “a musical figure in which, typically, two groups of three beats are replace by three groups of two beats, giving the effect of a shift between triple and duple meter.” I heard Peter Schickele on the radio once gives as an example “America” from “West Side Story”. "I want to be in America." - 1 2 3, 1 2 3, 1 + 2 + 3 +. Much of the commentary in this week's "homework" is over my head, but I was struck by Kerman's assertion, on page 341 that the finale of Opus 131 "ranks as his greatest finale." That will certainly give me something to listen for when I listen to it again. Tom, I sometimes struggle with the analysis as well. I do enjoy Kerman's writing even though I don't always understand it. I listened to "Blues for Allah" frequently in High School. I'm completely unfamiliar with any music by Wagner. Op. 131 seems a whole universe unto itself. I've heard it a few times, but don't really have a handle on it. I haven't grokked it yet. I do like the short call and response between the arco and the pizzicato parts in the 4th movement. Beethoven attempting to connect the transitions between the movements of this piece reminded me of the contemporary concept album. The bottom of p. 336 beginning with, "The cautionary indication ..." reminded me of warnings in books of the dead that sudden unexpected things can happen in bardo spaces. "An unforgettable dramatic note of menace is introduced into the atmosphere of prayer." Unfortunately, this had a real life analog about 6 weeks ago with the synagogue shooting in Pittsburgh. Blues for YHVH too. I am relieved to hear you guys(Tom and Eric) dont always understand Kerman either. I have found myself at times wondering if this was just to over my head and considered just stopping reading it all together. But alas I am glad to have stuck with it and just try to reflect on what I have learned since starting the book and not worry to much about what I have missed. As we all know the map is not the territory and as good of a map as Kerman has created with The Beethoven Quartets, it “is” a map after all. All my worries of comprehension of the chapter melt away when I sail the seas of the Quartets themselves. Blues for Allah is one of my favorites! 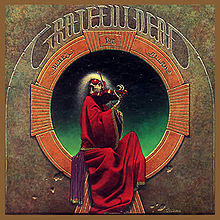 Whenever I see the various side projects of the remaining members of the Dead I always hope they play Blues for Allah. A bit of high expectation, I know. Very cool tune though! Gotta love that image as well. I know I do. Thanks for all the interesting comments. Oz, I find it interesting that you use the word "grok". I head Rachel Maddow use that word a few days ago. It warms my heart to know Robert Heinlein and the word he created still influence our world.